Ever since I saw Marcus Gronholm and Tommi Makinen throwing around dirt I was hooked. 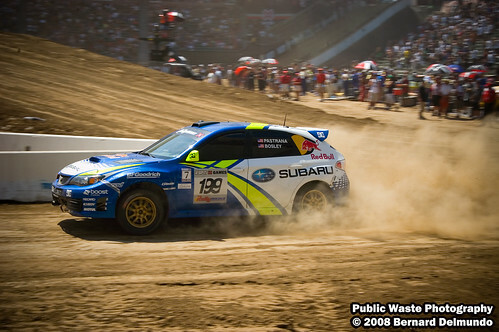 Rally racing is one of those things that has a huge following in every country except the US. The past 3 years, however, have been looking to change that. This year was indeed a big push to get Rally the much needed exposure it deserves. 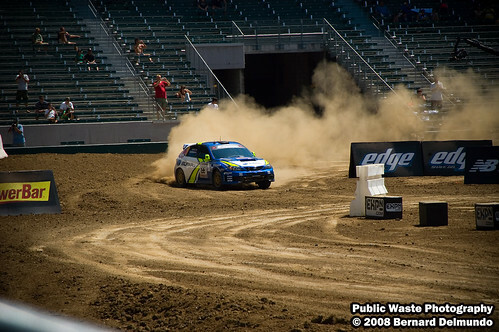 Rally racing is one of the most dangerous sports I’ve ever seen in my life. I LOVE IT. 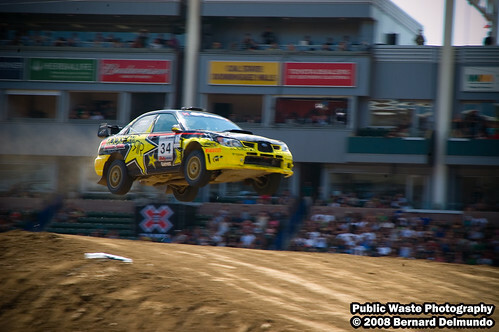 I’m happy to see ESPN and the X-Games making an effort to bring Rally into the mainstream public. For years rally fans have been glued to the television watching weekly updates of WRC. But when that television contract ended, we were all a little lost (thank goodness for YouTube!). By this time, racing organizations like SCCA, Rally America, and Gravel Crew have been bringing the dirty action to the States. 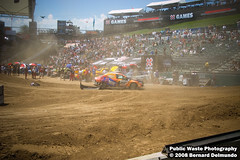 The X-Games once again brought Rally back to the televisions of the fans that have been waiting for so long. 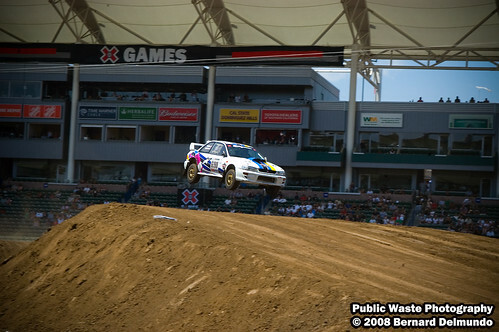 As one of those fans I’ll be first to admit: The X-Games rallying is NOTHING like what I’m used to watching on TV or in person. 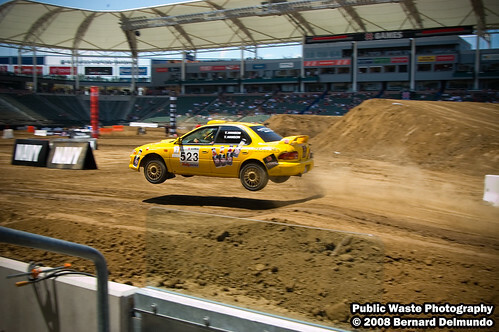 The commentators made it perfectly clear to the audience that what happens at the X-Games isn’t exactly typical of rally racing. 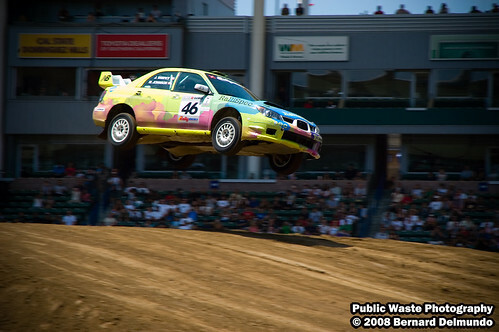 The highlight reels on the jumbo screen of the Home Depot Center provided the exciting visuals of the “Over the hills and through the woods” nature of normal rally racing. But imagine being able to watch the car run from start to finish and not just the 2 seconds of it flying by the spot you’re standing at. 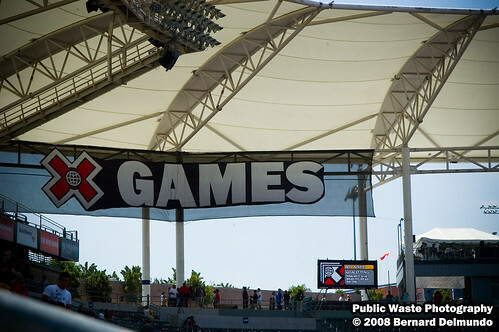 X-Games is perfect for this with its jumbo screens and stadium atmosphere. Bringing in the US favorites like Travis Pastrana and Tanner Foust, and even some surprising new faces like BMX star Dave Mirra, the X-Games is the perfect platform to showcase the skills and danger associated with this kind of racing. The one thing that continually stands out in my mind is the love and respect that the competitors, the X-Games, and Rally America showed to the late Colin McRae. 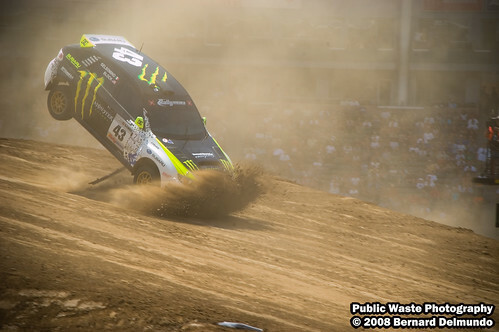 I got the pleasure of watching the former WRC competitor in action at last year’s X-Games only to be saddended by his passing soon after. 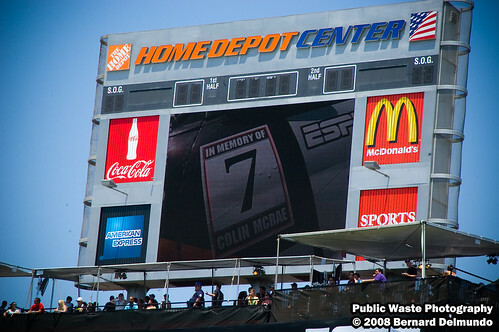 A tribute video (which also played on X-Center later on ESPN that night) pointed out that every car running at the X-Games and apparently on the Rally America circuit has a small vehicle designation decal showing McRae’s old #7 in memory of his time dedicated to advance the sport. 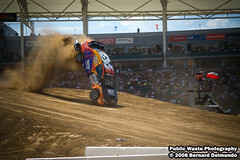 Spectacular crashes and high energy racing marked the final event of the X-Games weekend. Unlike the other events of the weekend, Rally saw so amazing slams with few injuries. 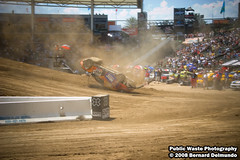 and Dave Mirra’s crooked landing on the big jump which put him into the wall in front of my seat. 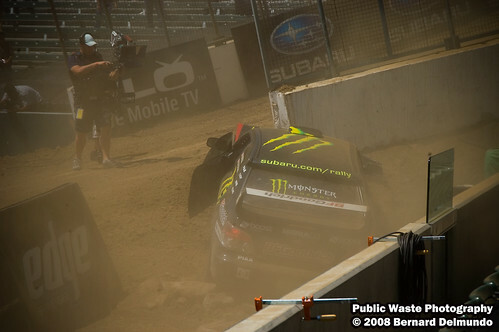 An honorable mention as far as crashes is Ken Block’s nosedive into the landing ramp. 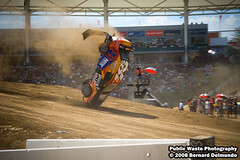 The damage to his car was enough to give Pastrana a free round to meet up with Tanner Foust in the finals. With two big names going at it, you know the final round was going to be intense. 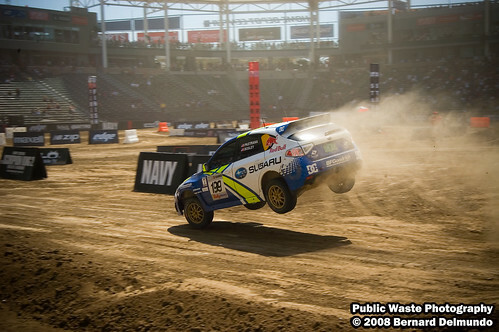 Foust, with one major flub, gave Pastrana an open door to Gold. My guess is that if Tanner hadn’t rubbed into the wall we would’ve had a photo finish on our hands (pretty similar to the ending of the semi-finals of last year’s X-Games). With McRae’s former co-driver (Carolyn Bosley) riding shotgun, Pastrana clenched another Gold to add to his ever-growing collection of X-Games medals. I watched the television coverage the same night which featured in-car footage we didn’t see in the stadium. 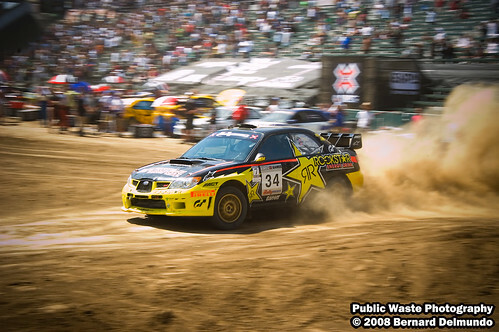 I was very happy to see that after spinning a few donuts for the crowd and while still driving the car, Pastrana dedicated his win to Colin McRae. This was an awesome event and I’m glad America is finally starting to see the level of skill and dedication associated with this sport. Click here to see more of the phenominal action I was able to capture. those are some really good pictures man, i was wondering if you were going to go to see that but my phone started acting up.